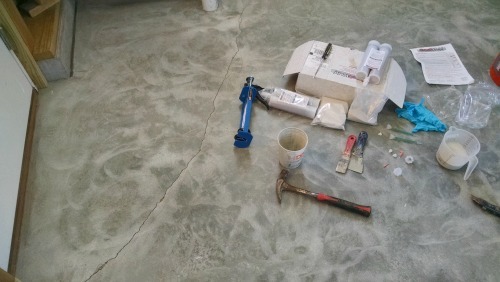 Concrete floor crack repair can be accomplished rather easily with RadonSeal's DIY concrete floor repair kit. Look, it's no secret, concrete floors crack. Even when the sub-grade is prepared properly, the concrete is placed and finished correctly, and expansion joints are sawed to control the cracks, a crack seems to appear sooner or later. As a concrete floor contractor, I've seen a lot of cracked concrete floors. I've also tried a lot of different ways to repair cracks in concrete slabs and floors. 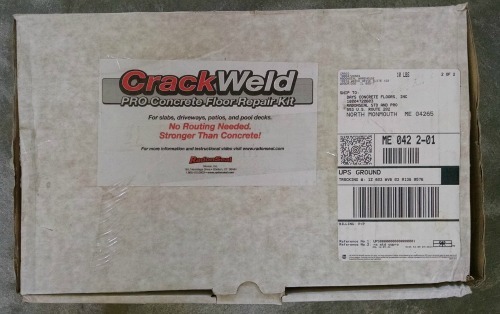 After using a lot of different concrete repair and patching materials, I discovered RadonSeal crackweld concrete floor repair kit. This crack repair kit has made fixing and sealing cracks in concrete floors very quick, easy, and economical for us and my customers. The picture above shows the duel cartridge kit. This is the one I buy since repairing cracks in concrete floors is part of my business. RadonSeal also sells a single cartridge kit if all you have is one or two cracks to repair. The caulking gun is not included in this kit. Here's a picture of the crack in the concrete floor I'm going to show you how to repair. The crack is about 6 feet long and up to 1/4 inch wide. We're preparing this garage floor for an epoxy coating so we want to weld this crack back together so it doesn't show through the new epoxy flooring. I'll explain how we prepare for and repair a crack like this, then you can watch my video to see for yourself how we repaired this crack. The crack needs to be clean and dry. I run a 4 inch grinder over the crack to clean the surface, then I vacuum it out to remove any dust & debris in the crack. You can just use a wire brush if you don't have a grinder, you want to make sure the surface is clean and there isn't any loose concrete or dirt in the crack. The kit comes with detailed instructions to follow. The first thing I do is take everything out of the kit and lay it on the floor. Remove the protective cap on the top of the cartridge. You may be able to break it off with your fingers, if not, tap it with a hammer to break the seal then break it off. Keep the cartridge held upright and place it in the caulking gun. Set on the mixing nozzle over the back-flow restrictor and use the same retaining nut you unscrewed from the top to tighten down the mixing nozzle. Purge (squirt) some material into a cup first to make sure the material is mixed correctly. You now ready to repair the crack. Note: After you've purged the cartridge, keep it pointed downwards. If the crack is wider than 1/4 inch, you will want to fill the crack up half way with sand first. If you don't, you'll loose a lot of the repair resin down through the crack. Wet out the crack by injecting some of the resin into the crack. Fill the crack with the silica sand. Go over the sand again with the epoxy resin. Use the puddy knife to mix the sand and resin, making a paste and forcing it into the crack. Leave this epoxy paste a little higher than the concrete floor. Wait about 10 minutes and scrape or sand the excess level with the concrete floor. Note: This repair material hardens very quickly. You won't want to stop and leave the caulking gun sitting on the floor before you're finished. You can stop for 30 - 60 seconds but not more than that or the resin will harden in the tip. The resin is quite firm at after 3 minutes and usually fully hard at 10 - 15 minutes. If you have a long crack to repair, I suggest doing 10 to 15 feet at a time. I own some 4" hand grinders, so I always grind the repair material smooth. It's not necessary to do this, but this method a very easy way to remove any excess material. If you're going to grind the cracks afterwards, you can repair all your cracks first, then come back and grind them. If you're scraping them with a puddy knife or sanding with a palm sander, then do this after about 10 - 15 minutes. If you have some repair resin left in the cartridge, unscrew the tip and replace the cap. Screw on the nut and store the cartridge in an upright position. Don't let the material freeze.. I highly recommend these concrete floor crack repair kits. 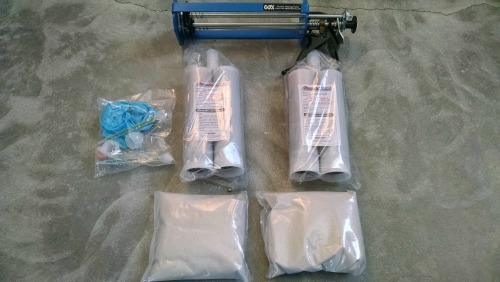 The kits along with the customer service from RadonSeal are excellent. That's why I use them. Purchase the CrackWeld 2-pack kit to repair up to 50 ft. of a 1/16” wide crack or 25 ft. of a 1/8" crack. Purchase the Crackweld 4-pack kit to repair up to 100 ft. of a 1/16” wide crack or 50	ft. of a 1/8" crack. You'll need a single cartridge caulking gun for the kits above. Purchase the Crackweld Pro kit to repair up to 100 ft. of 1/16" wide crack and you plan to start repairing cracks for your business. 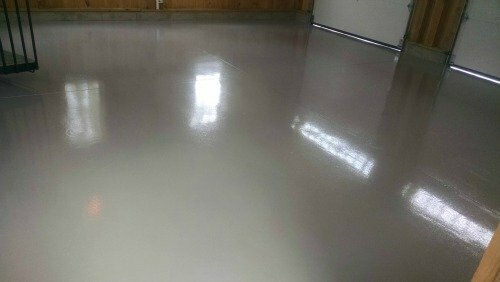 Epoxy Floor installed by Day's Concrete Floors, Inc.
After using the concrete floor crack repair kit to fix 3 cracks in the concrete floor, we applied our grey epoxy coating and the floor looked great. The customer was very satisfied.